French brigadier-general of artillery, retired; born at Nancy, Jan. 12, 1824. His father, who was a member of the Jewish Consistory of Nancy, was known as Moïse, though his name was Moïse Abraham. The sons were all called Moïse, and Édouard, a brother of the general, an artist at Paris, has retained the paternal appellation in the spelling Moyse (Moyse, Édouard). After passing through the Lycée atNancy, Abraham entered the École Polytechnique at the age of nineteen, Nov. 1, 1843. Thence he went to the School of Applied Sciences at Metz, from which he was graduated in 1847, after which he served for several years at Strasburg as a lieutenant. He was promoted to the rank of captain in 1854, and served in the Crimea on the staff of General Lebœuf. After the fall of Sebastopol he received the cross of chevalier of the Legion of Honor, as Captain Bernard Moïse. Having returned to France he was detailed in 1856 for service at the ordnance foundry at Strasburg. Two years later he married, and was obliged to assume the name of Abraham, under which he was registered in all the civil documents. In 1859 he took part in the campaign in Italy against Austria. For some time after the convention of Villefranche, Abraham remained in Milan, but subsequently returned to France. On the restoration of peace he was assigned to the department of artillery at Strasburg. He went to Paris, was promoted major, and took part in the Franco-Prussian war of 1870. He was detailed to the army of the Rhine at Metz, and there, after the battle of Gravelotte, was decorated with the cross of an officer of the Legion of Honor. 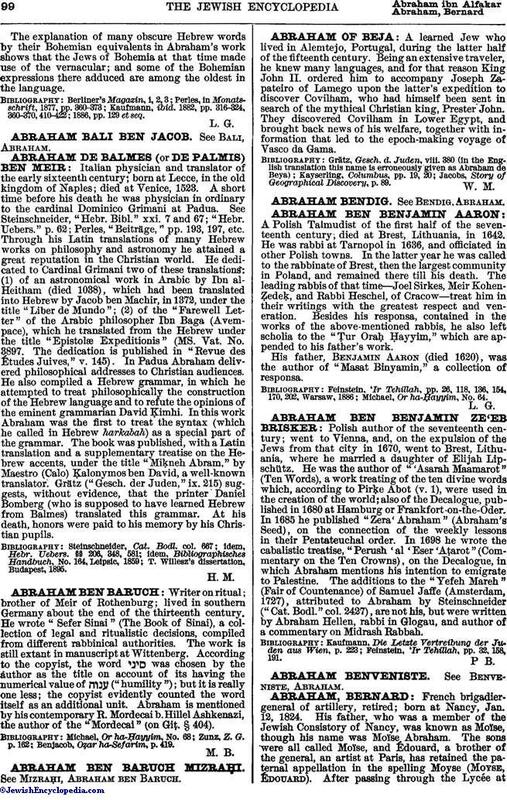 After the war Abraham was appointed secretary of the committee on coast defenses, and became a member of the military commission on railways. He advanced in rank rapidly, reaching the grade of lieutenant-colonel in 1874 and that of colonel in 1877. As the latter he commanded the Seventeenth Infantry, for several years, at La Fère. He was finally made brigadier-general June 2, 1883, and remained in active service till Jan. 12, 1886. 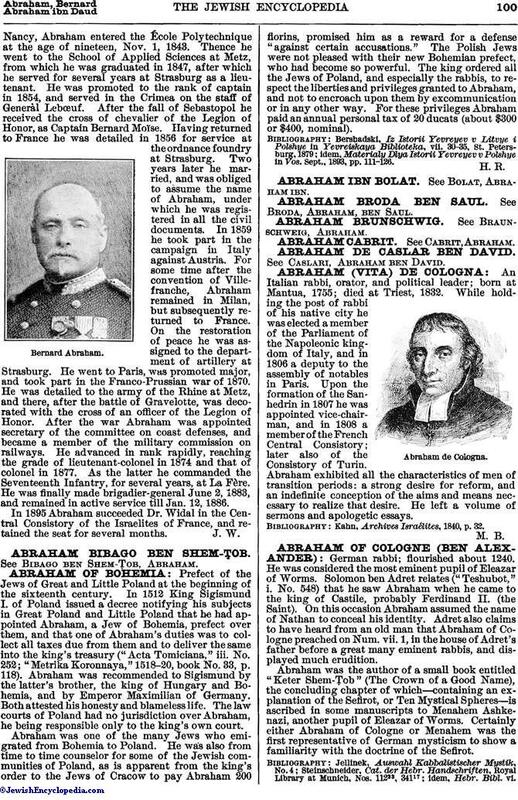 In 1895 Abraham succeeded Dr. Widal in the Central Consistory of the Israelites of France, and retained the seat for several months.